Red Doles Bridge No 11 is a minor waterways place minor waterways place place on the waterways major waterways place village town city on the Huddersfield Broad Canal between Cooper Bridge Junction (Junction of the Huddersfield Broad Canal and the Calder and Hebble Navigation) (2 miles and ¾ furlongs and 8 locks to the northeast) and Turnbridge Lifting Bridge (7¼ furlongs and 1 lock to the south). The nearest place in the direction of Cooper Bridge Junction is Falls Lock No 8; 1¾ furlongs away. 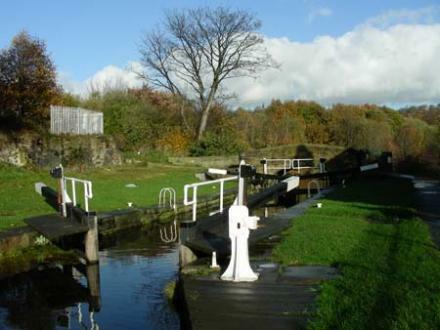 The nearest place in the direction of Turnbridge Lifting Bridge is Red Doles Lock No 9 (Also called Fartown Green Lock); a few yards away. Huddersfield — 151 yards to the south. 8 Viaduct Street, Huddersfield, HD15DL — 1590 yards to the southwest. Willow Park Business Centre, Willow Lane, Huddersfield, HD1 5EB — 1377 yards to the southwest. Leeds Road Retail Park, Huddersfield, HD1 6PF — 500 yards to the south. 87 Deighton Road Huddersfield HD2 1JU, Huddersfield, HD2 1JU — 1529 yards to the northeast. 2 Viaduct Street, Huddersfield, HD1 5DL — 1587 yards to the southwest. Huddersfield — 842 yards to the west. Huddersfield — 1280 yards to the north. 380 Leeds Rd, Huddersfield, HD2 1YY — 1155 yards to the east. Huddersfield — 1294 yards to the north. Huddersfield, HD1 6 — 919 yards to the south. 509 Leeds Road, Huddersfield, HD2 1YJ — 494 yards to the east. Huddersfield — 1259 yards to the southwest. Unit 3 Mead St, Birkby, Huddersfield, HD16HE — 1074 yards to the west. Alexandra House Spa, 128 Halifax Old Roa, HD2 2RL — 1223 yards to the west. 68A Sheepridge Road, Huddersfield, HD2 1HG — 1036 yards to the north. 90 Northgate, Huddersfield, HD1 6 — 1495 yards to the southwest. Red doles lane, Huddersfield, HD2 1YG — 271 yards to the southeast. 3 Green Abbey, Huddersfield, HD9 — 538 yards to the west. John Smith Stadium, Stadium Way, Huddersfield, HD1 6PX — 865 yards to the south. Huddersfield — 493 yards to the south. St Andrew's Rd, Huddersfield, HD1 6PT — 846 yards to the south. Huddersfield, HD2 1 — 1289 yards to the northeast. Huddersfield — 673 yards to the northwest. top bodies gym 29 St John's Road, Huddersfield, HD1 5BW — 1498 yards to the southwest. Stadium Business & Leisure Complex, Stadium Way, Huddersfield, HD1 6PG — 832 yards to the south. 8 St John's Road, Huddersfield, HD1 5AT — 1637 yards to the southwest. Huddersfield — 1416 yards to the south. John Smith's Stadium, Bradley Mills Road, Huddersfield, HD1 6PQ — 842 yards to the southeast. Bradley Mills Lane, Huddersfield HD1, Huddersfield, HD1 6PG — 797 yards to the south. Huddersfield — 1064 yards to the southeast. Stadium Way, Huddersfield, HD1 6PE — 875 yards to the south. Deighton Road, Huddersfield, HD2 1 — 1316 yards to the northeast.